What you should know is that Across The Himalayas Treks Pvt. Ltd.
has been organizing tours to Tibet since 1980 and we know the historical as well as recent developments of everyplace tourists can visit, not only thoroughly, but better than almost anyone in the world. We do not fantsize about the available facilities in Tibet to win you in one of our tours, but, just opposite, we make you aware of all the hardship you may encounter on a Tibet tour. We believe in the Motto: "Once you are mentally and physically prepared to take a hardship of a Tibet tour, you enjoy this mystic place doubly more. Day 1 and 2 – Fly from Destination to Hongkong. A 3 hour train ride will take us through the south-Chinese tropical landscape to Guangzhou where we will stay at the white swan Hotel or Garden Hotel. In the morning flight from Guangzhou to Chengdu. In the afternoon sightseeing tour of chengdu including a visit to Baoyin Temple on outskirt of chengdu, which is dedicated to lamaistic Buddhism. Overnight in jin jiang Hotel. A 2 hours flight from chengdu will bring us over the mountains of eastern Tibet to Lhasa (12050 ft.). On way to Lhasa, about 13 miles before reaching the city, we shall visit the Dolma Temple in Nethang, where Atisha, one of the holiest preacher of Buddhism, lived and died here in 1054. Rest of the day is at your disposal for resting and to acclimatize yourself at this altitude. We shall visit the Dalai Lamas fabled winter residence-the Potala palace, the Jokhang Temple, the holiest spiritual cnter of Tibet Buddhism, Norbulingka-park, the summer palace of the 14th Dalai Lama. Besides the important monasteries of Drepung and sera we shall also visit, time permiting, the monastery of Garden, 37 miles east tally destroyed during the cultural revolution and is at present under re-construction. The situation of this monastery in the form of an amphitheatre alone makes the excursion worthwile. Begin our overland expedition to Nepal. Following the Tsangpo towards East we drive today till Tseland, wherefrom we shall visit the Yarlung-valley and samye monastery during the following two days. Excursion to Yarlung valley. 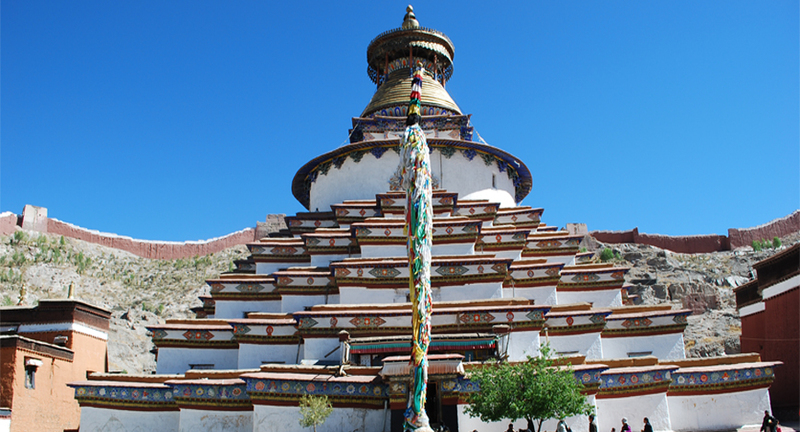 Enroute visit the recornstructed monastery of khrabrug, one of the oldest monasteries of Tibet. In the opper part of Yarlung-valley lie the tombs of the kings of Tibet from 7th till 9th century. These tombs has not been excavated, hence we shall see only the outer part of the tombs. After lunch visit the yambulhakhang, originally the oldest building of Tibet. This Temple was destroyed totally during the cultural revolution and has been reconstructed in its original form. Drive along the Tsangpo River for 20 miles and then cross the river by the ferry. From the north bank of the river we undertake the further journey the samye by tractor (approx. 45 minutes). This monastery was build around 770 by padmasambhava himself is till today one of the most important monasteries of Tibet. A very long, but enriched with scenic beauty, drive lies ahead of us. Gyantse is situated of the junction of the ancient, trade route between sikkim, India and Lhasa and is the third largest city of southern Tibet. Today's drive takes us over two passes, kampa La (15840') and karo La (16500') along the tourkish blue yamrok Lake. Gyantse retains even today an ancient Tibet character. In the morning visit of the Palkhor-Monatery of Gyantse and the beautiful Khumbum-Charten. Proceed to Shigatse where we shall visit the Tashilunpo Monastery in the afternoon. The residence of the Panchen Lamas, Shigatse is the second largest city of southern Tibet. Built 1447 Tashilunpo is one of the most imposing construction of Tibet, which housed at one time more than 2000 monks. On the way towards Nepal we shall visit today another highlight of the expedition-the Sakya Monastery. Built in 1071 here begun the Sakyapa-sect of Tibetan Buddhism. During 13th and 14th century sakya was the most paworful political center of Tibet, under direct supervision of the emperors of the china in Beijing. After the visit of Sakya, proceed 30 miles furthur west to Lhatse and then another 50 miles south to shegar. The drive between Lhatse and Shegar takes us over highest pass on this route, Gyatso La (17300 ft). From here on lies the spectacular panorama of the Himalayan snow-mountain range in front of us. Overnight in Shegar in a simple Guest House. Drive via Tingri, from where a magnificient panorama of Mount Everest and Cho Oyu can be seen. Further we cross the 16900 ft high Sefo La and then descend in two hours to the Tibetan-nepalese border town of Zhangmu. Overnight in Zhangmu Guest House. We leave Tibet and drive along the Sunkosi River, reaching Kathmandu in the late afternoon. Day 17: Sightseeing tours in around Kathmandu. Day 18: Fly home from Kathmandu.